There are many Tollywood stars who have cast their votes and pictures of these celebs have taken the internet by storm. Some of the celebrities even requested their followers to go out and vote. Veteran actor Chiranjeevi, his son Ram Charan, were spotted along with their family outside the polling booths. Samantha Akkineni along with husband Naga Chaitanya, Rana Daggubati, were also seen posing for the media after casting votes. Catch all the Live Updates of the Lok Sabha Elections 2019 here. 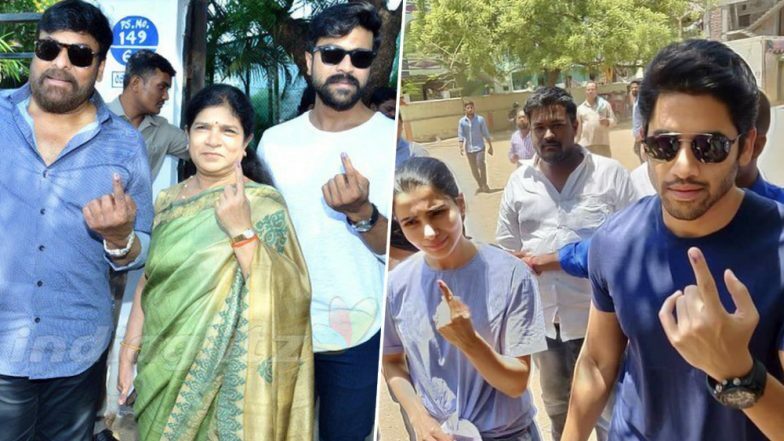 Pawan Kalyan, Allu Arjun, Jr. NTR, SS Rajamouli, Amala Akkineni, shared pictures on their social media handle after voting in the 2019 Andhra Pradesh Elections. After casting vote the ace filmmaker Rajamouli tweeted, “Half of my unit members left to their towns and villages to exercise their vote... Good... Do Vote... If you think no party/candidate makes a difference, make use of nota.. #IndiaElections2019 #LokSabhaElections2019 #VoteForIndia”. There many other celebs across the industry who have come forward and requested their followers to cast vote. Lok Sabha Elections 2019: Pawan Kalyan Casts His Vote in Vijayawada, JSP Chief Talks About EVM Malfunctions (Watch Video). The first phase of the 2019 Lok Sabha Elections started today (April 11). It has commenced in 91 constituencies across 20 states of India. The security has been beefed up across the country for the ongoing elections. The counting will take place on May 23. Stay tuned for further updates.